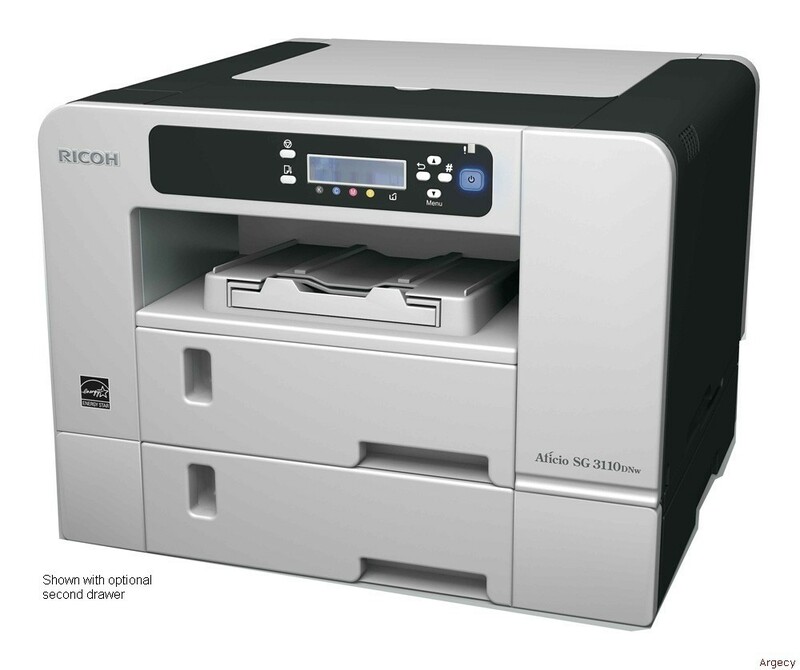 The easy-to-use RICOH Aficio SG 3110DNw GELJET printer delivers high-quality color output without compromising productivity, the environment or your budget. It combines the convenience and value of inkjet printing with the speed, consistency and advanced media handling capabilities of a plain paper laser printer. Take advantage of exclusive, fast-drying viscous ink technology to produce compelling color documents that won't smudge or bleed. With its sleek design, compact size, front-facing control panel and standard wireless connectivity, this printer can be placed virtually anywhere for fast, easy access to key functions. USB 2.0 cable is not included with main unit and must be purchased separately. An optional 250-sheet Paper Feed Unit increases paper capacity to support longer print runs. Add two optional Paper Feed Units to raise capacity to 750 sheets. Add a 100-sheet Multi-Bypass Tray to print onto heavy stocks and postcards up to 140 lb. Index, and create banners up to 51" long. Black & White: 29 pages-per-minute, Full-Color: 29 pages-per-minute*. *Speed based on High Speed Mode (300 x 150 dpi). **Using RPCS Driver. Print speed may vary based on print job and print configuration. *Simplex mode only. **Supports 42 lb. - 68 lb. Bond only.